Welcome to Prague, one of Europe’s magical cities. Situated on the banks of the River Vltava in central Bohemia, this beautiful city is rich in history and is home to some of the world’s most pristine collections of architecture. Included is a three-night stay in Prague. This morning we explore the sights of the Old Town Square on a guided walking tour. We see Mozart´s Theatre, Little Square and Astronomical Clock. We continue our tour and walk across the Charles Bridge spanning the River Vltava and full of portrait artists and small vendors, to board our coach to drive to the 1,000–year–old Prague Castle area. With our local guide we walk through Hradcany Square, for the spectacle of the Changing of the Guard. See the magnificent Loreta Monastery, and arrive at Hradcany Castle. Here we see Old Kings Palace, St. George´s Monastery and The National Gallery painting. 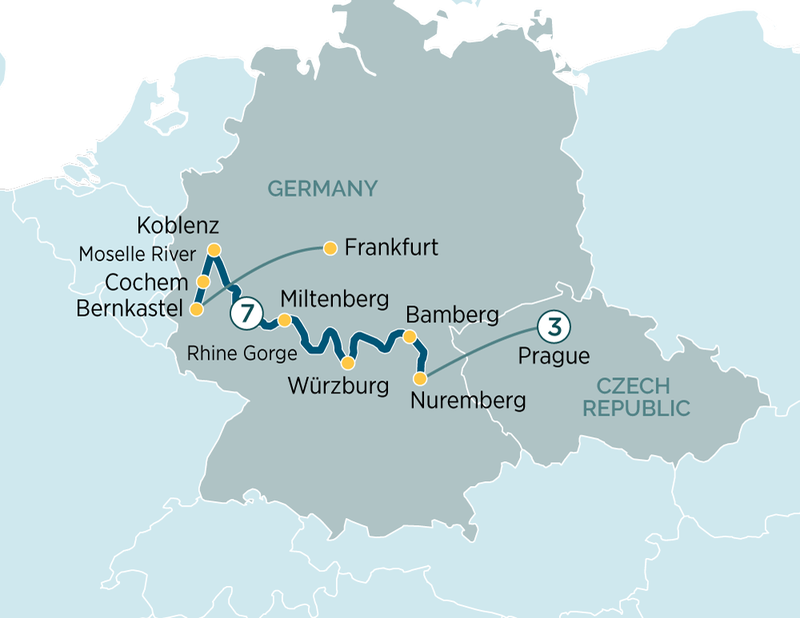 Transfer by coach to Nuremberg to join your fellow passengers on board of the Emerald Waterways luxury river cruise ship. Tonight, you will sail through the Main-Danube Canal. Wine-lovers will relish a journey to the centre of the Franconian wine country to taste local produce in the beautiful setting of the Bishop’s Cellar in Wurzburg.